I think this lure should be called the “Lipless Louder than a Dump Truck Driving Over Speed Bumps at 70mph Lure”. This lure contains glass and brass rattles that produce a very unique fish attracting sound. Right out the box the LV Series lures are effective baits that require no after market modifications. Each bait comes standard with a high performance split ring to ensure that the bait runs true cast after cast. It also prevents anglers from tying their knots directly on the split in the ring, which would cause line breakage. These spectacular lures also come from the factory with super sharp treble hooks that can withstand the abuse from catching hundreds and hundreds of fish. When selecting the color and size of bait to use I go by a very simple rule of thumb. This rule is just my own personal opinion and should not be viewed as the only “right” way to chose colors and sizes. When the sky is overcast or the water is overly stained I tend to use a gold colored bait. On sunny days or in clear water situations I go for a silver bait. My two favorite colors of LV Series baits are Aurora Gold and American Shad. These particular colors add a little bonus to the standard gold and silver baits. They appear to have almost a holographic design that refracts light and produces multiple colors at the same time. Three time Bassmasters Classic qualifier and Lucky Craft Prostaff member Mike Auten would tend to agree with my method for bait color selection. While speaking with Mike he told me that on cloudy days he prefers to use painted baits that don’t offer much reflection. He said the paint itself would refract any available light and make the bait more visible to the fish. On sunny days Mike prefers to use a chrome colored bait that will reflect the sunlight through the water. As far as choosing which size bait to use, 99% of the time I will throw the 7/16 ounce LV 100. If the fish seem to be a little finicky I will then downsize to a 1/4 ounce LV 70. On days it seems only the smaller fish will take the smaller baits or if I simply need to get the bait down deeper on my retrieve I will then tie on a 3/4 ounce LV 500. For those of you just starting out I would recommend buying the 7/16 ounce size. This is an all around good size that will allow you to get comfortable with the bait and at the same time build up your confidence level. Once you gain that all important confidence in the bait by all means feel free to buy all three sizes in a variety of colors. When it comes to retrieval speeds and techniques involved with the LV Series, I have no set in stone formula for choosing which one to use. I simply try one for a while and if it doesn’t produce I simply switch it up a little. Usually I will begin with a fairly quick tempo retrieve with a few quick jerks thrown in to add erratic movement to the bait. I will also use what I call the “side to side” and “up and down” retrieval methods. These techniques are as simple as their names. As the name implies when using the “up and down” method I will simply move my rod tip up and down at a relatively slow rate. This will change the depth at which the bait is running just a little bit with each movement. With the “side to side” technique I move the rod tip from my left to my right and then back again at a slower rate. This will allow the bait to have a little variance in its course of travel. Although these techniques seem very minor and on the verge of being dumb, they can in fact put a lot more fish in the livewell. The easiest way to explain my logic behind these simple methods is to just ask yourself “when the last time was that you saw a baitfish in your favorite lake swim in a perfectly straight line?” Now you understand my methodology don’t you? Another retrieval method I use is too simply “burn” the bait through the water. There have been several cases where I will find a warm pocket of very muddy water containing a large number of bass. Usually when I come across this situation, I can only get those fish to strike the bait by casting as far as I can over the pocket and reeling the bait in as fast as I can crank. When I mentioned that point to Mike Auten he said well that just goes to show you that fish are going hit what they want and not just what they are supposed to want. Throughout the course of my conversation with Pro Angler Mike Auten he told me some of his favorite techniques and times to use the Lucky Craft LV Series lures. Mike said that the LV Series is a great search bait because; you can cover a lot of water with the lure. He said he likes to fish the bait on large flats, flats that have a lot of grass on them and a variety of other applications. 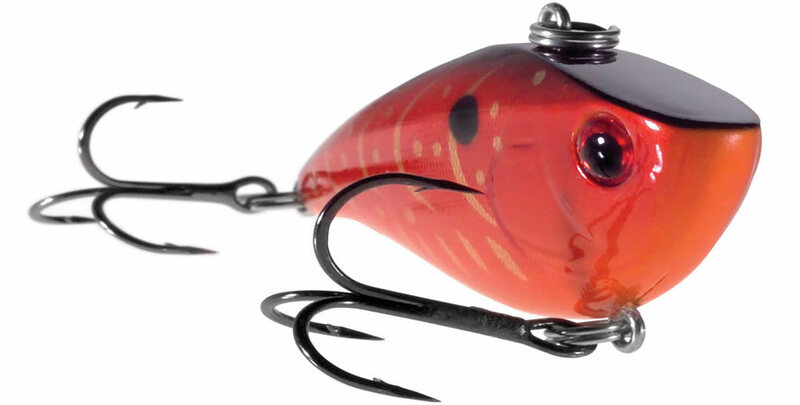 He also stated that the LV Series lures would stay in the strike zone a lot longer than other baits. Mike also reiterated the fact to me that it is very important to stay in contact with the cover you are fishing. Whether it is grass or lay downs try to keep the bait as close to that cover as you can get it. It is also very important to bump the cover as frequently as possible. I agreed whole-heartedly with Mike Auten when he said that in his opinion the LV Series of baits from Lucky Craft is a great bait even for beginners. This series of lures is easy to use and will catch an abundance of fish. Give this bait a try and I am positive you will soon find yourself in bass fishing heaven. When most anglers hear the words tube jig, they think of some clear, rocky, smallmouth infested lake. Yes this is the perfect bait for those conditions, but a tube jig can be used in any type of cover and conditions, to catch some pretty hefty largemouth bass. The reasons being, is that it is not a common lure for fishing timber or vegetation for largemouths, and the fish are not used to seeing a tube.